If you love to pay a visit to temples in Macau, then come to A-Ma Temple which is the oldest and built in 1488. 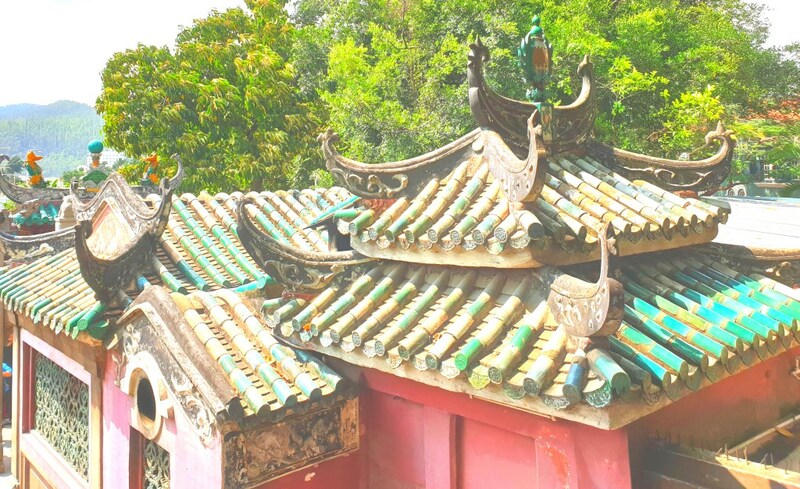 The temple is a UNESCO World Heritage Site, a beautiful Taoist temple, nice decoration and well preserved. The temple was built by the local fishermen and dedicated to the goddess of Mazu, protector of fishermen for a safe harvest. The temple is facing the sea 400 years ago. Now it is facing some busy main road but you are still able to spot the sea when you climb up to the top. It is believed that the name of Macau is also coming for the goddess A-Ma. When the Portuguese landed on the sea 400 years ago, it was near this temple. When they asked the locals the name of the land, the locals thought the Portuguese wanted to find out the name of the temple so they answered “Ma Ge”, hence the name of Macau came about. One of the characteristics of this temple is you notice very big coil of incense hanging all over the temple and these coils can burn for days. It also creates a good aroma too. Some giant incense sticks can be seen burning in this temple. A-Ma temple is built in a hill, so expect some climbing. When you reached the highest point, you will see a huge rock painted with red Chinese words. That is the end of the road as you cannot proceed any further. A-Ma temple is so important that it is also featured on the Macau 10 dollar note. Side note: If you are visiting Hong Kong and Macau, there is no need to change into Macau currency as you can also use the Hong Kong dollar in Macau. Since A-Ma temple is built by the local fishermen for the Mazu, you will find many sailing related stuff in this temple. A miniature sailing ship can be spotted in the temple, look carefully at the ship and you are able to spot a pair of eyes drawn at the ship. A huge crowd of visitors surrounding this magic bronze bowl. A guy is rubbing the handles of the bronze healing bowl filled with coins, hoping to see the water burst up – meaning good luck will be with you. Goddess of Mazu is widely worshipped in the coastal regions of China, Taiwan, Singapore and Malaysia, and other South East Asian countries. It is especially popular in Taiwan as her temple festival is a major event with the largest celebrations. You will notice the shops and building near A-Ma temple is named after Ma Kok, that’s the original name of this place. The brightly colored rooster at the front of the shop, is called the Galo de Barcelos and is one of the national symbols of Portugal, can be seen here in Macau too:) I actually bought one of the mini roosters during my trip to Portugal, Lisbon a few months ago. Macau was formerly a colony of the Portuguese Empire so there are many Portuguese elements found in this country. One of them is “pasteis de nata” also known as Portuguese egg tart. Not far from A-Ma temple there is the huge bronze Guan Yin Statue. The Guan Yin statue is located near the sea, along Ave Dr. Sun Yat-Sen. Quite isolated but can be seen from far. There is a lotus at the foot of the Guan Yin. It was sculptured by a famous Portuguese artist name Cristina Rocha, created in parts in Nanjing. If you look carefully at the face of the Guan-yin, you will see a blend of European and Eastern elements. The sculpture of Kuan Yin in Macau is simple but elegant. Most importantly, this big Kuan Yin in Macau is built to bring peace, harmony, and prosperity to the people. Many believed that after the installation of the Guan Yin, the Macau economy improved. Do include A-Ma temple and have a stroll around the surrounding of the temple. It is small but worth to pay a visit since the name of Macau (Ma Kok in Cantonese or MaGe in Mandarin) actually originated from this temple. Furthermore, this temple is also listed in the UNESCO World Heritage Site. A good half an hour is perfect for the visit to A-Ma temple. By the way, it is only 10 mins drive from St Paul Ruins. You may want to take a taxi as it doesn’t cost much if you have a pax of 4. You can walk to the ruins of St Paul if the weather is cooling, takes about 30 mins by foot. I would love to go there one day. I’ve always been so fascinated by Asian culture and architecture. It’s just amazing. A-Ma Temple is the oldest temple and how Macau get it name from, so it is really worth to pay a visit even the temple complex is not big. You are right about it, the culture is rich in A-Ma temple. This is also a Unesco World Heritage site. how fun! what a gorgeous place this is. i would love to visit and see it. There is a magic bowl bonze in the temple is also another highlight not to be missed. This is to check your good luck. what an amazing experience, to visit this place and see its beauty! thank you for sharing your experience and such great photos! There are bakery shops near A-Ma temple, worth to go in and get some free samples to try the local cookies. I’d definitely consider visiting A-Ma Temple if I ever happened to visit Macau. Such a beautiful place, full of rich culture and history. I highly recommend anyone who visits Macau to include A-ma temple, it is the origin of Macau. This place is amazing I have been to Macau and visited this temple as well ☺ Macau is beautiful! Glad you have also visit Macau and sure you enjoyed it like I do. I have read a lot of times about the A-Ma Temple. I need to visit this lovely looking place soon. Being Macau’s oldest temple, A-Ma Temple is truly one of the places you should visit to fully get in touch with the historical aspect of this magical city. I do enjoy it a lot. I would love to see this myself one day. Your photos and description are wonderful! You can always include Macau (1 day) into your Hong Kong (3-4 days) tour. Informative write up with stunning photographs. Your post brings Macau heritage alive to me. Thanks for your comment. I hope you find this post useful. A-Ma temple also offers excellent views for tourists touring the temple and is also a cool silent place to relax in the midst of the busy city of Macau. What an amazing journey! Your photos are beautiful! Oh this is all so amazing! I lived in Asia for four years and saw the most amazing sites. Thanks for sharing your adventure! Glad you love Asia and have been explored many interesting sites. i would love love to have the pleasure of visiting here! Your pictures are so beautiful! Your photographs are beautiful. Thank you for sharing. I would love to visit there one day. Wow that looks like a beautiful place to visit! It sounds like you had an amazing trip. The best thing is there is no entrance fee. Anything that is free, work well for me. I never really thought about going to Macau before, it looks beautiful though. May need to add it to my want to do list. If you love gambling, then Macau is a great place to visit. It is like the Las Vegas in Asia, casinos in all corners. Even if you don’t prefer gambling, you can still do a day trip in Macau. Some other top attractions are Cotai Strip and St Paul Ruins & Senado Square. I haven’t been to Macau yet but this makes me want to go! I don’t know much about it but with attractions like this, it seems so worth it to go! These photos are beautiful! Looks like an amazing adventure!! Wow that temple is huge! So many things to see and take pictures of. It looks so amazing through the photos. What a stunning place to visit! I love the architecture and all of the details. Thank you so much for sharing a glimpse of what this place looks like. That egg tart looks really yummy and delicious!